Are you human? Do you hate reading distorted text? Google has some good news for you. The Internet giant is doing away with the random combinations of blurry letters and numbers that it has used to keep robots from pretending to be human. Because the robots have figured those out. Using artificial intelligence, Google says robots are able to solve even the most complicated distorted text at 99.8% accuracy. So the next time you buy something online you might not have to read distorted text in a box. 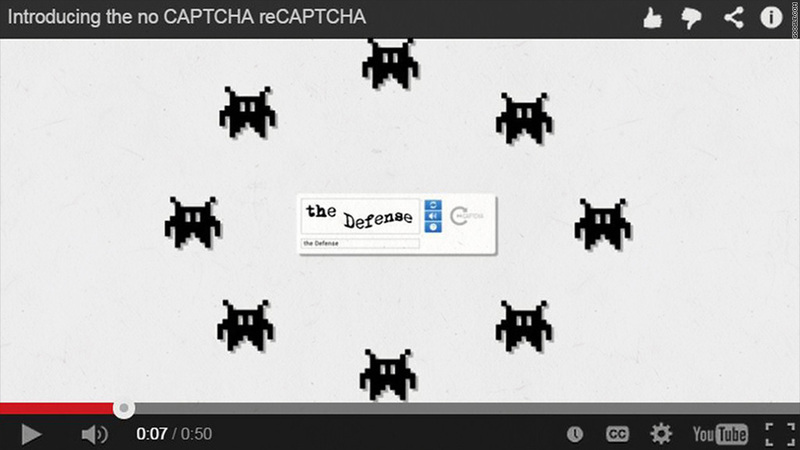 Google (GOOG) is getting rid of that filter, known as captcha. Now all you have to do to prove you're human is check a box that says "I'm not a robot." That's according to a blog post by Vinay Shet, a product manager at Google's recaptcha. The new interface uses advanced analysis to spot robots, according to Shet. It monitors a user's activity before, during and after the box is checked to determine if that user is a human. "Humans, we'll continue our work to keep the Internet safe and easy to use," Shet writes. "Abusive bots and scripts, it'll only get worse -- sorry we're (still) not sorry." But the new system is not entirely fool proof. If the technology is still not able to ensure that a user is human, it will look for more clues by putting users through more "security checkpoints," including distorted text. Google says early adopters, such as Snapchat, WordPress and Humble Bundle, have had encouraging results with the new interface so far.